This is a good deal for 2 tickets if you're a movie goer! 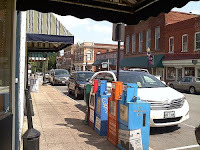 Two Saturdays ago, I went to Culpeper for (yarn) shopping and luncheoning with some TNK friends (Barbara 2, Christina, Issy, Linda, Mary and Renny). We took the quick route up I95 and then out Route 17 (I think) toward Culpeper - it was uneventful which was fine because we all just wanted to be there and see the new shop our friend had opened! 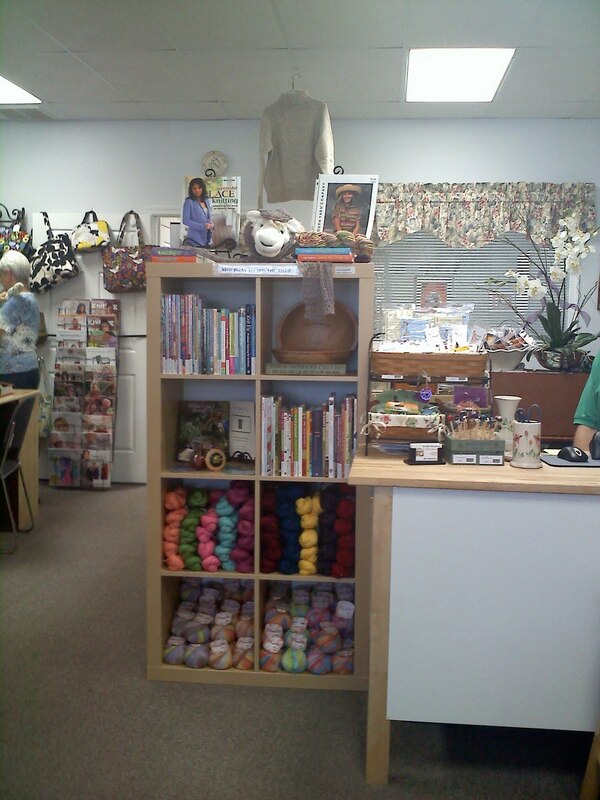 Dog House Yarns & More is located in a little strip shopping center on Sunset Lane (there are good directions on their website as well as background info about Culpeper too). 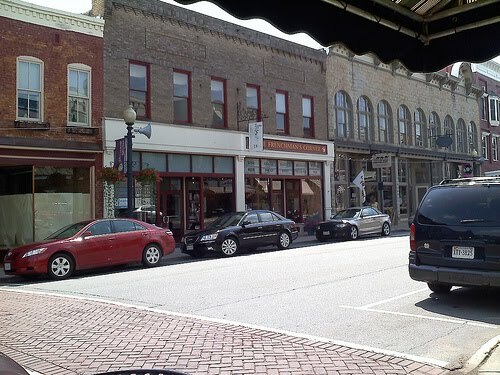 Culpeper is a really, really quaint little town and I had no idea it was so doggone cute! I definitely want to go back and explore on a more comfortable day. 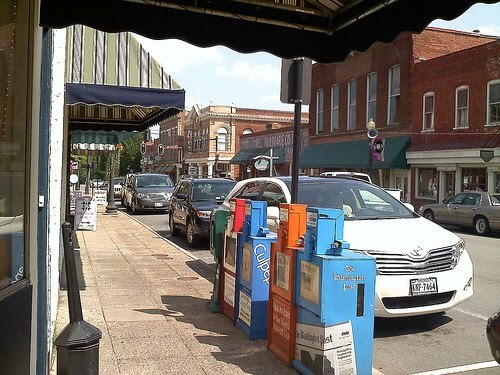 The temperature in downtown Culpeper at 3 pm was 109 F - yes - it actually read 109 !! I guess that was just the heat index - but hot enough that smart people should have all been inside and, as you can see in my photos of Davis Street (looking each way outside the restaurant we ate in), most folks were relatively smart! 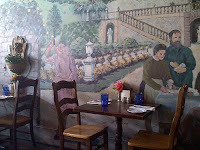 Outside the restaurant looked like these two photos (do you see any people?) while inside was cool and interesting (see photos below). 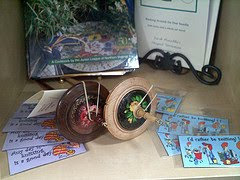 But I have sped up and skipped over the visit to the shop - so I will back up a little. I don't know why the photos are formatting so oddly, but please bear with me! 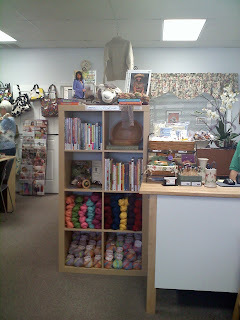 On to the actual shop visit, Dog House Yarns & More has a comfortable feel and the owners could not have been more accommodating to our group. 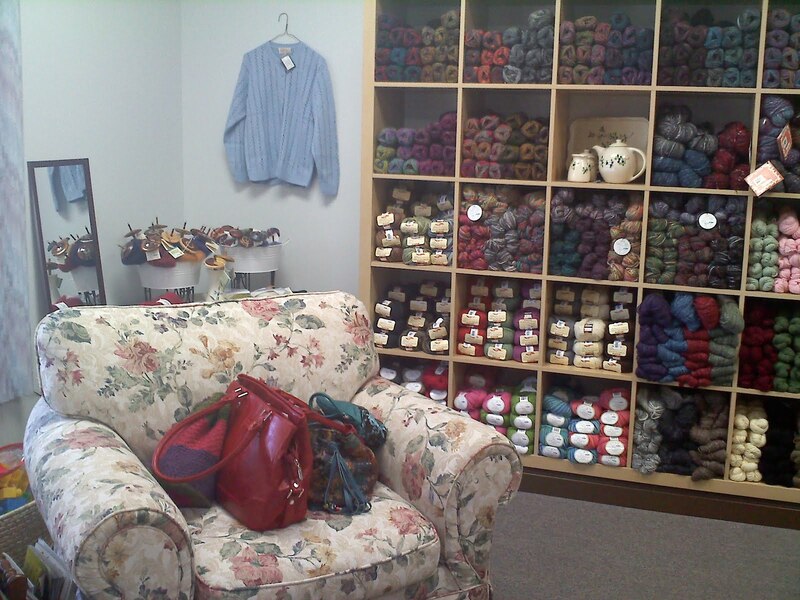 There are comfy arm chairs to curl up and knit in, tables to hold the many pattern books to peruse, and bin after bin of yarn to fondle and dream about! 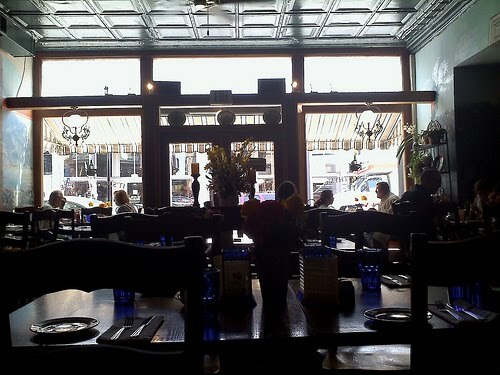 It was a wonderful visit and meal and I am looking forward to going up again soon, but I do think I will wait until the weather is cooler - at least below 90 F !!! So, you wanna see the results? 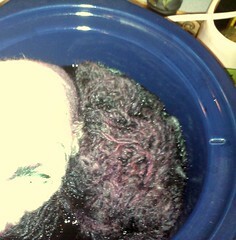 Dyeing to know? 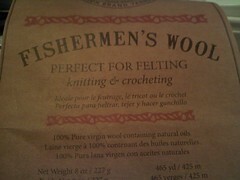 My plan is to knit this up into EZ's Rib Warmer a la 1956 or 1972 (or is it 1984)? Either way, it's a classic. I recently purchased SO17 from the School House Press website - have you been there? A pattern sheet for $1.00. That's right, one whole dollar. Can't beat it with a stick! 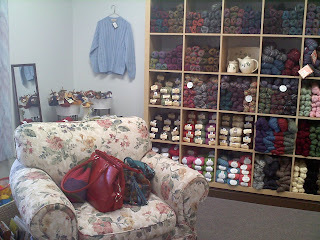 Last weekend, I went to Culpeper with some fellow TNKers to visit Doghouse Yarns & More - report on that yarn crawl to come another day! Neat, huh? How I just have to wait to touch it! July is almost gone, but where did June go? It's been hectic in my little world lately, but I'm still out here, doing something, trying to get by and have fun while doing it! 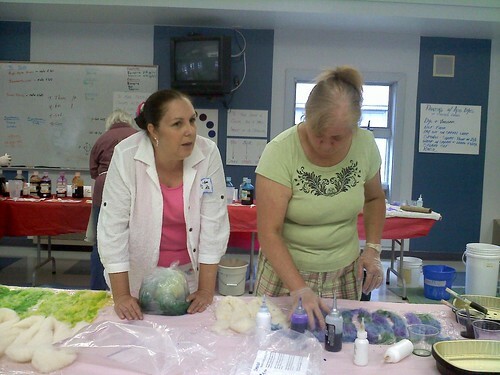 This month, River City Knitters' meeting consisted of a dyeing demonstration facilitated by Andrea McGee. 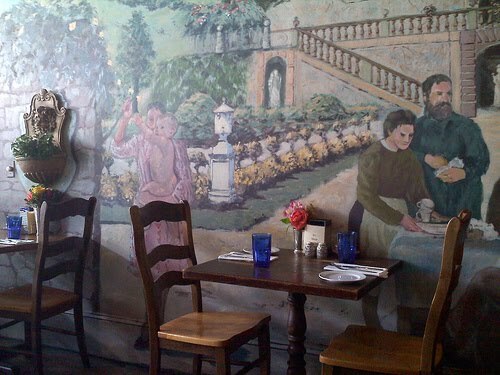 Here are a couple of photos - I had not planned to get my hands dirty per se, but ended up getting drawn in anyway! The second photo is another member's dye-job - mine turned out looking like a rainbow - it will be real interesting to see how it comes out once it is 'cooked' and dried. 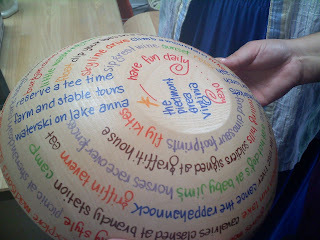 Andrea took our works home with her, and we'll have to wait until August to see them! 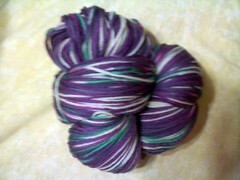 Interestingly, Clothos Handspinners also had dyeing on their July agenda... I attended with some friends, but did not participate actively b/c I had not signed up. 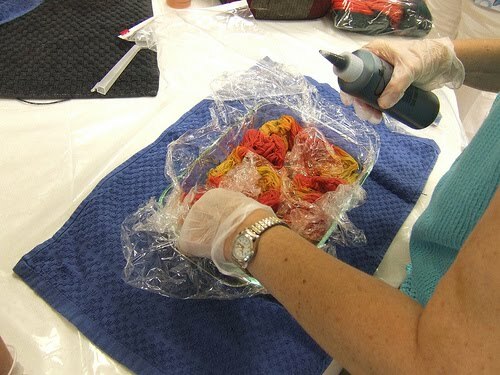 Here's a photo of Olivia (see Virginia Knits) 'helping' a fellow dyer! 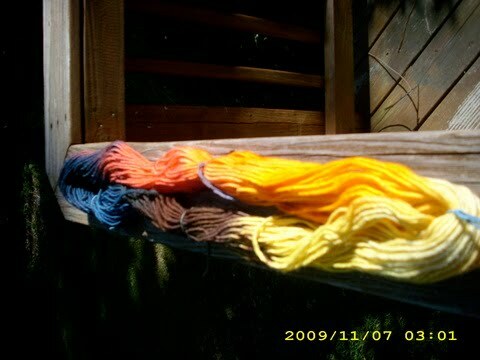 The skein and the loose yarn is home now, dripping and drying. 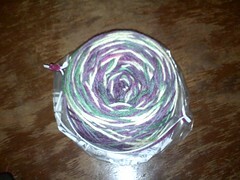 I'll still have to unwind the skein and rewind it into a new ball. Now, you're just going to have to wait with me to see how it all turns out! Since I was not able to attend MS&W this year (see below), I have been avidly reading descriptions and seeking out photos from this year's festival. This blog, Araignees Tangled Web, has a great description and wonderful photos - almost makes you feel like you're there (without the heat LOL). 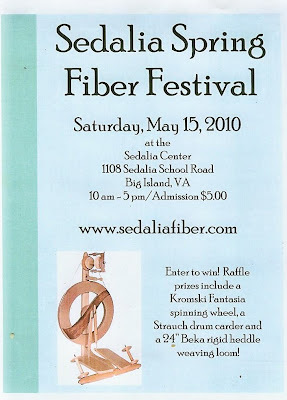 And on this famous knitter's site, you can even see a fellow TNK'r Barbara 2 (Barb is way down in the MS&W post in a blue festival t-shirt in a photo labeled as a 'fan' whose name the author could not remember)! Friend of the acquaintance of the famous - that's me! The third blog on which I enjoyed reading about the festival is here, on the Knitter's Review website. Again, good photos and great descriptions. I could not go to Maryland because my son T, a senior in H.S., was attending his prom the same night. Here is my son and his girlfriend M in her parent's front yard prior to the prom... don't they look lovely and so grown up? I think so. You can't tell from this photo, but M's dress sparkles too. Since the James River H.S. 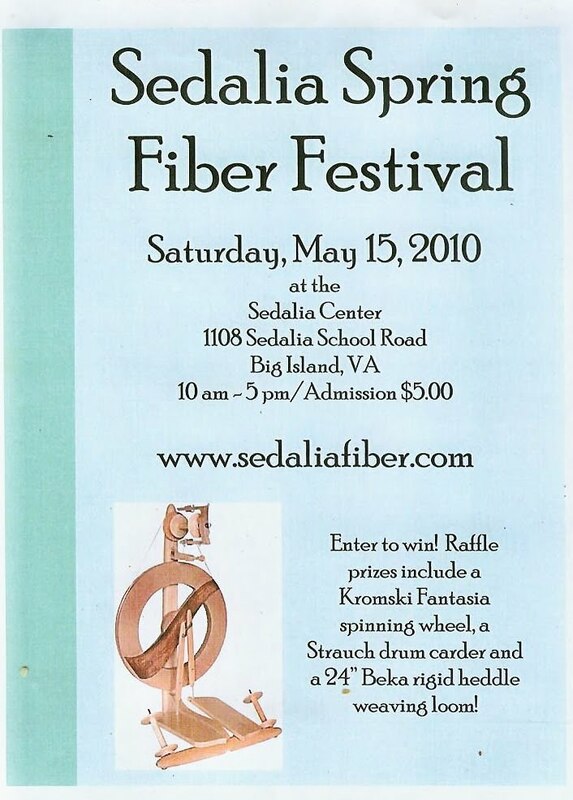 prom is the same day as both Maryland Sheep & Wool and my BF's daughter's wedding shower, I have volunteered to work at the Sedalia Fiber Festival on May 15 - to make sure I get to go! If you attend, please come by and say hello - I should be at the Green Tent working the raffle. Click the word raffle to see exactly what WONDERFUL things are available to win. Is it just me or is time just passing much too quickly?! 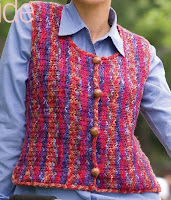 I have finished the side to side vest - except for the button band and buttons. I am working on a spring knitted tee-shirt for myself in a pretty pink (Lion Brand Cotton Ease) as well as a traveling scarf... right now I have Michelle's scarf and Suzanne has mine. I'll find and post a photo of my 'seed scarf'. Michelle's pattern is called the Sock Remnant Scarf and it's cute. Tom and I traveled to Connecticut to visit and tour Lincoln Technical Institute on a bus with other parents and students from all over Virginia -- the bus driver got lost both on the way up and on the way back... there's something to be said about a professional driver and I guess we got the discount version! LOL What a long 36 hours we had. In (w)one word, Wicked was wonderful! After work on Thursday I met El and Va at St. John's United Church of Christ and enjoyed dinner in fellowship with El's cousin, her children, and others. Once dinner was done, we walked the few blocks over to the Landmark Theater (FKA The Mosque) just in time, basically. Lots of people continued to mill about but the staff shut the entry doors promptly at 7:30 - lots of people missed the opening number of the show because they had not returned / found their seats yet. We were told when we handed our tickets to the ticket-takers that the show would start promptly at 7:30 and it did. 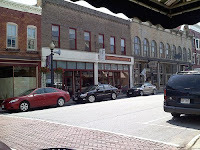 I have put two links to the theater on purpose - the first one is a site set up years ago and includes lots of interesting info about the theater itself; the second one - The Mosque - is the 'real' one which reflects current shows, speakers, etc. Wicked was 3 full hours but it went by really quickly - this show does not drag and keeps your interest throughout. Now I want to see it in other venues and compare! Don't you love pattern photos?! I do - they inspire and challenge me. 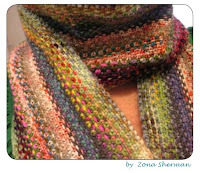 I hope mine is as pretty as this one - doesn't it look like it was woven instead of knitted? I am going to see the road show of Wicked with some girlfriends tonight! I have not read the book but have listened to the soundtrack on the official website so I won't be totally unfamiliar. On the kneedles: working on a jacket (for moi), a vest (also for moi) and several other things... check Ravelry to see what. That's about all I have to report! I feel like that's all I do - go to work, come home, fix dinner for my men and 'mules, knit some while watching TV, go bed and do it all over again the next day! That is not to say, though, that I don't enjoy my weekends, no-sir-ee-bob! Saturday morning, Chris and I decided to go to a movie. Because I don't like crowds, we went early - we saw a 12:30 pm showing of Shutter Island - can you say - whew?! One article I read said that it was over long... I disagree; both of us enjoyed it and were caught off guard by the twist at the end (no, I won't divulge it here so no worries). Another article (or maybe the same one, I don't remember) said that since Leonardio diCaprio always played off his boyish charms, he could not pull this one off... again, I disagree. If suspense and psychologogial thrillers are not your thing, don't see this one. 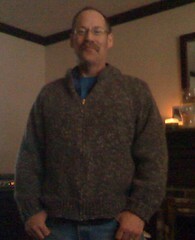 On the knitting front, I have several FO's to report: (1) the purgatory sweater (aka Chris's jacket) is complete. Yay! It fits great (yeah, just like someone knitted it just for him) and is warm. Here he is wearing it the second I got the zipper installed. Gave it to him as an early Valentine's present (instead of the really late Christmas gift that it really was). Also, on Ravelry, I am participating in a scarf swap and I have completed my partner's scarf ... are you ready for this...?... ten days early! Yes! It turned out lovely, and I so hope she enjoys it. I am not going to post a photo yet, but I will once she receives her package. Happy knitting all to all. A Time to Ring in the New! Pick Up Sticks and Knit! How did 65 painstakingly decorated cookies become 51? My Life Has Gone to the Dogs And I Love It! Please feel free to leave me a comment or email me at tinkerbelle@yarnhound.com -- I'd love to hear from you! Dogs In Danger - click below to help !! 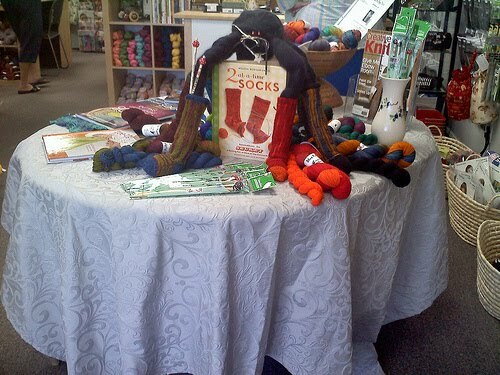 Knitters Review Upcoming Events !! You are orderly and good at following a set plan. Your talents lie in working with written records and numbers in a systematic, orderly way. You would make an excellent: Bank Teller - Bookkeeper - Court Clerk - Mail Carrier - Post Office Clerk - Secretary - Timekeeper - Title Examiner - Typist. The worst career options for your are artistic careers, like comedian or dancer. WeatherPixie - hope she's back soon!